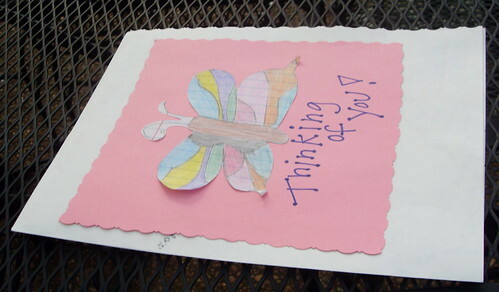 At the begiining of the year there was a “Handmade – Pay It Forward” challenge going around on Facebook. Sounded like fun to me. 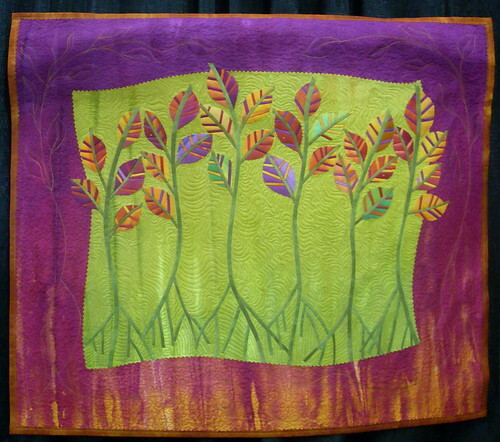 You promised to make something handmade in 2011 for the first 5 people that commented on your post. 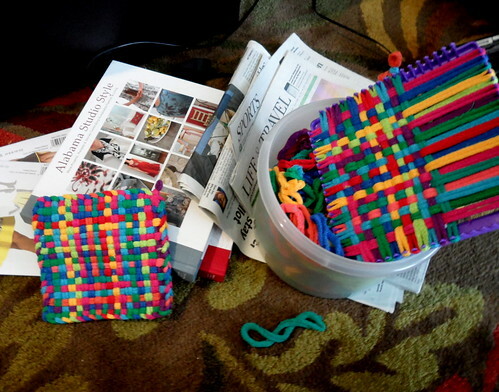 My favorite potholders / hot pads are the ones made out of cotton loops. It’s sorta difficult these days to find the bright colored loops. Alot of what you find in the craft store are nylon and yucky. 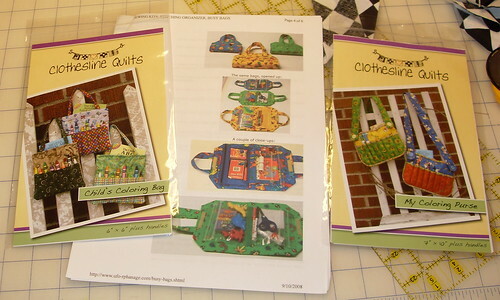 But, I found these, made by Harrisville Designs, also sold on Amazon. I made two potholders for each of my 5 people and sent them out last week. Emilee came home from Grammy’s today and was very happy with her corner! 🙂 It still needs work, but I got the sewing stuff cleared out. 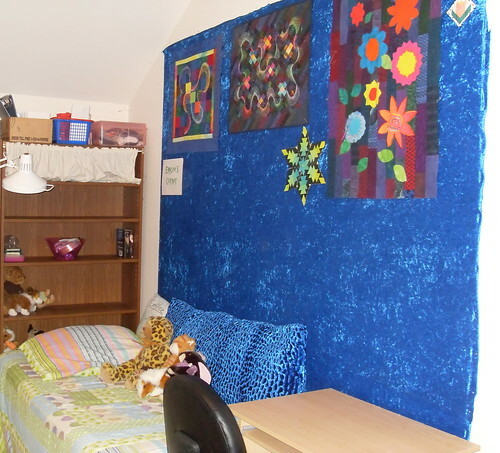 I covered the homosote “design” wall with bright blue crushed velvet panne. Man alive, that is stretchy stuff!! I hung a couple of “in progress” probably never to be finished quilts at the top of the wall. 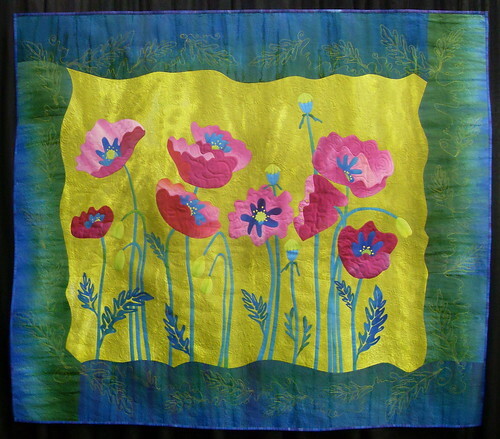 The one is the center was made by Libby Lehman and is featured in her book Threadplay. 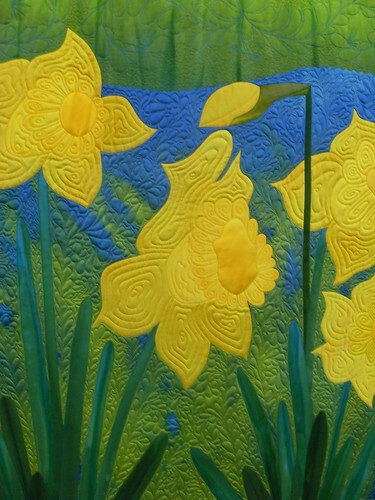 She is my favorite quilter/teacher. It’s been too long since I’ve taken a class with her!! I’ll give Emilee a couple of days to add her “touch” to the space. I’ve also got some more cleaning/restacking/organizing to do in the rest of the room. Back to work tomorrow after a long holiday break!! I read thru my resolutions that I blogged about on MySpace last year. I still need to work on the same resolutions! But I do like New Years and New Beginnings. My girls have been begging for their own rooms. We live in a 3 bedroom house with 3 kids, so had to brainstorm to come up with “a way”. I know alot of larger families grew up in smaller houses, but I finally got my own room when I was about 13 and I loved it. It was my refuge, so I “get” how much it means to want your own space. I still like having my own space. 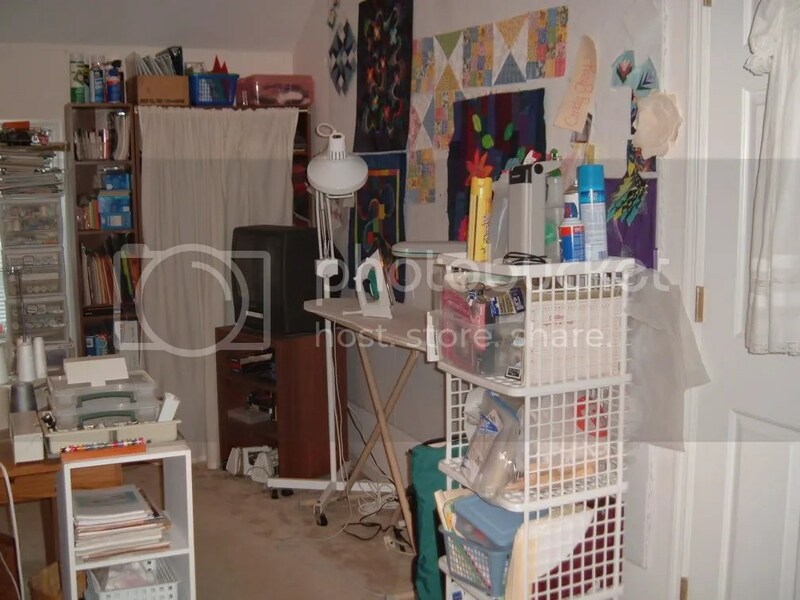 When we moved to TN and was house shopping in 1993, one thing I wanted was a room for my sewing/quilting “studio”. The house we bought has pretty large bonus room, and I have it crammed full of “stuff”. We’ve thought about “adding on” to the house, but time, energy and budget never seem to be aligned. The best solution we can come up with for now is for me to “share” the bonus room with my 10 year old daughter, Emilee. So, I’ve spent the day trying to move stuff around to find a place for her bed, and a place for some of her “stuff” and clothes. Emilee is in KY until Sunday, she stayed with my mom when we visted last weekend. So she’s hoping to come home to a new “space”. Emilee likes to sew, craft and all of that, so I think she will be happy having the craft room be part of her space. I work from home from this space as well, so that’s something I’m going to have to figure out. But with wireless connections I can be pretty mobile. Here’s the “before” of Emilee’s Corner, I’ll post updates as this progresses. Hmmm, found this in my “unpublished” list, looks like I started it on 11/21…….. I don’t know what’s up but I found myself sorta getting into the holiday spirit this morning!! I’ve been a bit funky, blah lately and I’m tired of it! Lots of stuff going on, sick kids, estate stuff, work stuff, stuff piled up everywhere, just stuff! I’ve been getting out to see quite a bit of live music, which is good! You can go over to my myspace and check some pics and see some video. Recently I was at one of those shows in Nashville where you never know who might show up. I ended up sitting next to Bonnie Bramlett, singin’ and swayin’ along with her while Billy Swan sang, “I Can Help”. that’s just crazy! Delbert McClinton was there, a bunch of Muscle Shoals “swampers” good times. Also been to several writers nights, it’s always inspiring to me to go hear aspiring artists play. People going after their “dream”. One show I attended with my friend Patty and my daughter Chelsea was an instore gig at Best Buy, Kevin Lawson, Billy Montana and Keni Thomas were playing. Great guys, and read their back stories here’s some guys that are “making a difference” while pursing their dreams. Anyway, I think a couple of things I saw on Keni’s album cover and in an interview helped me readjust, you just never know when you are gonna get one of those “messages from God”. I’ve got a theme for the annual Gray Family Cookbook, Soup’s On! I ordered a Christmas Present, shopping has begun. I’ve got 3 or 4 live music gigs that I’m looking forward too, Bluebird this Saturday, Jeffrey Steele on the 29th, Black Honey (new to me band with players I know) on Dec 12. 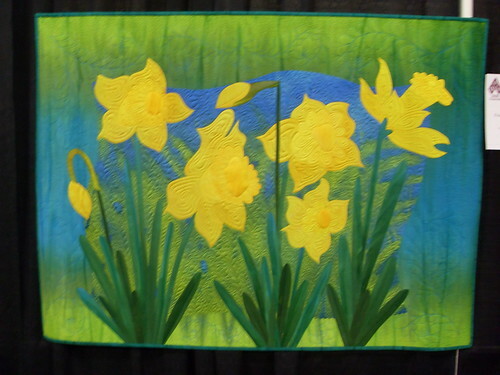 I had a couple of ideas for Inspiration, I bought some patterns at the AQS Nashville Quilt show, and I did some surfing and I found a site that had some instructions for making a busy bag. 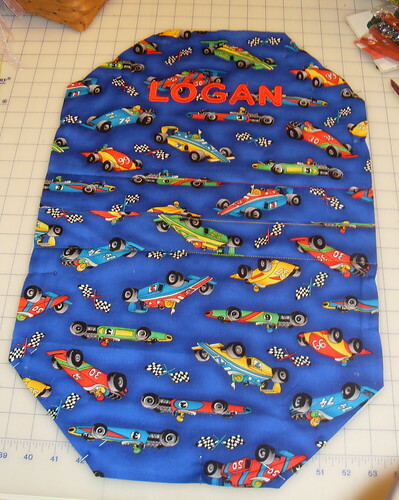 I used some race car and black/white check fabric that I had “stashed”. I think I had actually made some Halloween costumes out of the fabric a few years ago. 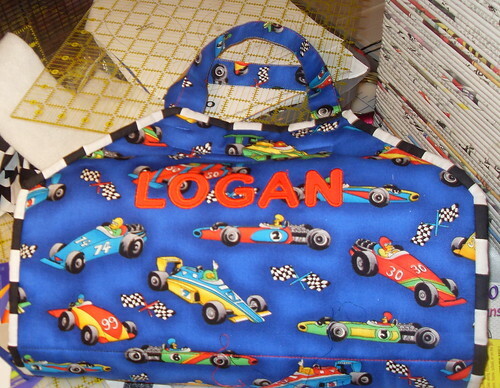 It was a directional print, so I cut and flipped the fabric so the cars wouldn’t be “upside down” when the bag was closed. 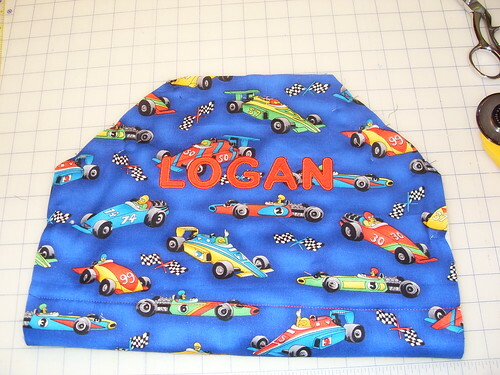 I machine appliqued Logan’s name using letters from “Sew Many Designs” . The letters are red ultrasuede. For the inside, I didn’t have enough of the fabric for a continuous piece of fabric, so I pieced in the black/white checks. 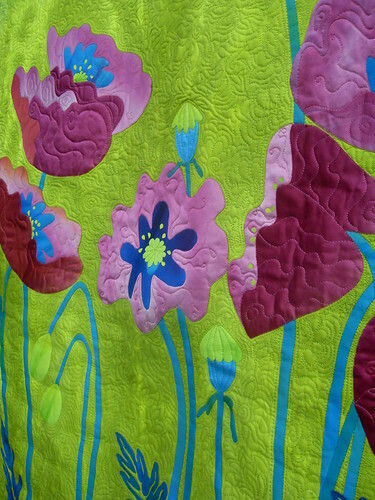 I used fusible fleece for the batting, and “quilted” thru the seams. I cut off the corners at a 45 degree angle to sorta match the bags from the inspiration instructions. I decided that instead sewing and turning the fabric I would “bind” it with the black/white check to add to the racing vibe. 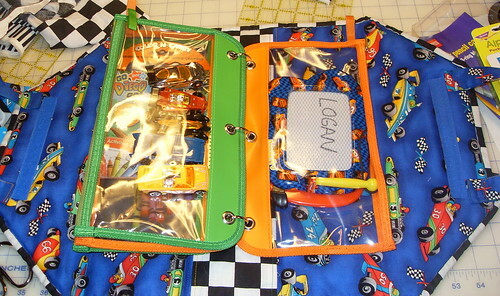 The pattern from the website uses plastic ziplop bags for the pockets. I didn’t think those would hold up too long for a 3 year old. When I was “back to schoo”l shopping, I noticed the bright zippered pencil holders. I had planned to cut those up to use for the pockets. But, when I brought it all home and started playing with it, I thought well, you know, this would hold more “stuff” and be more flexible if it were more like a “notebook”. So I took apart a 1″ binder that was around the house that my kids had demolished the cover anyway. My husband helped remove the brads that attached it to the old notebook binding leaving nice holes to use to attach the rings to the quilted fabric. I did some loops with some thread worked like a buttonhole stitch to better secure the rings. I added some handles and velcro and loaded it up with some goodies that I thought would keep a 3 year old boy busy!. I gave it to Logan this weekend, and I think he liked it! John Mellencamp has a song with a line that has really hit me the past few weeks, “Life Is Short, even in the longest days”. I have learned to just “hang on” and see what happens the last week of August, many of them over the years have been life changing for me. The past few years have been pretty good, I’ve made new life long friends and enjoyed some awesome music. On MySpace I have blogged before about August 28. This year the past few weeks have been pretty sad. My long time co-worker and friend’s 16 year old son, Hayden Carter, was killed in an automobile accident. At the funeral home visitation seeing his friends come together to remember and grieve was both sad and inspiring. Hayden was a skateboarder. I saw pictures of him “proudly” displaying a scar from a broken arm. His belongings looked very similar to the things my 14 year old son owns. When I talked to his dad, Ron, he said the same thing to me that my cousin said about his 19 year old son that died about this time last year and that was, “I just feel like I’ve got to know my son over the past few days, there was so much that I didn’t know. How many people he helped, inspired, many stories.” I left the funeral home with an urgent need to spend time with my kids, esp. my teenagers. Over the summer my father in law really began a steady decline. Over the past month and a half my husband spent as much time as he could in KY. His dad was admitted into a nursing home at the beginning of August. He passed away with his sons by his side in the wee hours of Tuesday morning, August 26. Roy Gray was what many people would call an “ordinary man”. Recently the pastor at my church spoke and blogged about how extraordinary it is to be considered an ordinary man. In case you don’t click on the link, “Remember this: an extraordinary life is lived in ordinary moments, seizing those ordinary moments and out of them creating something amazing”. Keith and I got married on his birthday. It just sorta worked out that way. He was very much a “say what you mean, and mean what you say” type of person. He also did not waiver on his beliefs and convictions. I never knew him to change his mind too many times. He was a stern man in alot of ways. It was amazing to me to see him with babies and little kids, he’d hold them, bounce them, carry them around. But, if one his his sons or daughter in laws hugged him, it was like hugging a tree. He and Keith’s mom were married for over 50 years when she passed away in 2000. Mr. Gray (and no, I never called him Roy, I didn’t call him Mr. Gray either, I just sorta avoided addressing him by name) I think truly died of a broken heart. It was good to spend alot of time with family and friends. Times like these does remind you that life is short even if some days are long. I was worried about the kids being behind from missing 4 days of school. Emilee came in Tuesday with this card. 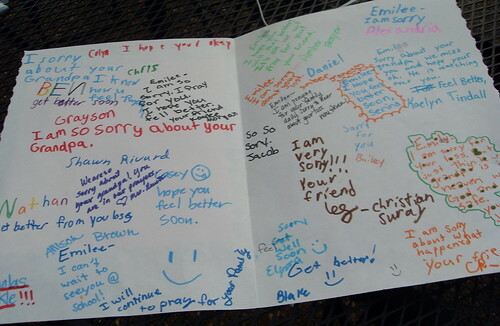 I thought it was just so thoughtful and a very nice reminder that people do care, and 5th graders can be quite eloquent. Thanks so much for the emails, cards, flowers, prayers and thoughts sent to us over the past couple of weeks. Really? 200 minutes? So, I called the store, they finally answered. So when they told me it would be an hour to an hour 15, I was relieved/happy? What happened to 30 minutes or it’s free? One school project is complete, an “about me” hat. 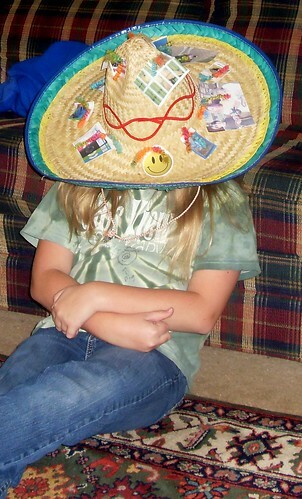 I helped Emilee “sew” the pictures to the hat because tape wasn’t sticking so good. Adam is working on a “totem pole”, he took xrays of when his arm was broken and mangled for that! Thank goodness, that’s being constructed “at school”.